The last ten years has seen the increasingly widespread use of specialist mini-cameras and remote control heads across a wide range of areas of the entertainment industry including: reality shows, hard-hitting documentaries, dramas, sports coverage, TV commercials, and news and current affairs programmes. Productions use minicams as single camera units (one-off specialist shots), for undercover surveillance, as on-car/motorcycle mounted cameras and on full-blown multi-camera remote head, fixed minicam HD productions. High-end HD minicams offer a wide variety of creative options but as minicam technology is getting better and better, it can sometimes be more difficult to pick the optimum minicam for a production than to decide on the main camera and format. This is where specialist technicians can really help with consultation and advice based on their wide experience of using these cameras. Historically, it was undercover documentary and nature film productions that first began to use minicams. This was before the demand for this technology really kicked of with the advent of major reality shows, starting with Series 1 of Big Brother back in 2000, and then the multiple other similarly filmed shows that have followed. Now, 12 years on, there are minicams and remote minicams being employed on all types of small and big screen productions. First up is the very popular and extremely versatile GoPro mini HD camera. Although not true HD in the broadcast sense, this camera is an excellent piece of kit that can now be found on many TV productions. Whether you're shooting a car- or bike-mounted exterior or an extreme sporting event, the GoPro can capture ultra-wide angle HD video that is acceptable as part of the SD content of your TV production. Not wanting to do ourselves out of a hire… but every DoP who works in TV should have one of these. You can mount them anywhere, on practically anything, and in all weather conditions; then take it home and use it on your mountain bike or kids’ skateboard. Your producer, director – not to mention the kids – will love you. Do make sure you get/hire/buy the latest GoPro though. GoPro launched the HD Hero 2 at the end of last year. It shares the same dimensions and ultra-wide angle 170 degree lens as its predecessor (the HD Hero) and is supplied with all the same mountings you need in order to mount it to almost anything. It also uses the same waterproof housing, that not only makes it completely splashproof but also turns it into a proper underwater camera capable of depths of up to 60 metres… but that’s were the similarities end. There are big differences in the new GoPro HD Hero 2 over the original Hero. The Hero 2 has the ability to capture full HD at 1080p, whereas the earlier model could only achieve this at 720p (16:9) or 960p (4:3). If you are looking for slow motion, the new Hero 2 offers a 120fps mode at 848 x 480 which will slow the action by four times. The team at GoPro has even improved the time-lapse feature, which can now take photos automatically at preset periods; this is available at half-second intervals and burst shooting at 10fps. With up to 9 hours of record time on a 32GB SD card this makes for a very useful tool on just about any production but perhaps the most important difference from the previous version, from a production perspective, is the HDMI and external microphone ports. Clearly, the GoPro 2 is a useful tool and certainly makes an ideal action camera on location, but you need to know its limitations. It is a favourite with production managers because of its low hire cost but they are often under the misapprehension that it offers broadcast quality HD. The fact is that the single CMOS sensor is only 0.435 inch big and this means that this camera does not qualify to any national or international broadcast specifications for HD. Also, the camera records in MPEG-4 H.264 which can sometimes lead to issues in post-production, especially with AVID. Finally, there is only a limited amount of setup you can do on the GoPro and so camera matching to your main camera can be quite difficult and this can obviously lead to a much heavier and costly grade in post. The first affordable truly HD minicam came along in 2009 from Sony in the form of the now commonly used HXR-MC1. For the first time we had a camera that could output and record in 16:9 (at that time a rarity) as well as output 1080/50i. This minicam, which was essentially a Sony AVC-HD camcorder with the head separated from the recorder by a cable, allowed high quality HD images to be captured at a fraction of the cost of the alternatives on the market at the time. It was not all good, though, as the camera head still didn’t meet the broadcasters’ requirements for full HD and only had the ability to record in AVC-HD, which is not an acceptable HD format and one that can still cause importing problems with Avid Edit systems. Using an external recorder such as the Convergent Design NanoFlash overcomes this problem but you have to rely on the use of a non-lockable HDMI cable. Another shortfall was the lack of an external microphone/audio input, leaving only the camera’s internal mic, plus a separate sound recording device might be needed. All that said, the Sony HXR-MC1 is still very much a favourite at Prime and is used on a variety of jobs. Not to be outdone by Sony, Panasonic launched the Panasonic AG-HCK10G a year later (2010) and, like the Sony, the Panasonic was a split camera head and handheld recorder but that is just about the only similarity. The AG-HCK10G camera and AG-HMR10 CCU recorder provided a huge step forward. The camera was signed off by many broadcasters as full HD because of its 1/4.1" three-CMOS camera system producing 1920 x 1080 high definition video. This camera has a full range of professional features with menus for white balance, gamma curves, detail and timecode settings. In addition, it is a truly multi-regional camera allowing progressive and interlaced recording in both the PAL and NTSC flavours of HD. The camera also has an input for external audio, meaning that you could now record sound directly to the camera without worrying about sync issues of external audio. As broadcasters do not regard AVC-HD as an acceptable HD recording format, Prime has custom-built portable rack systems that can take up to four Panasonic AG-HCK10G feeds (per rack), recording on to four Convergent NanoFlash recorders at 50fps with a timecode feed and audio recording on to a 788 recorder; all recording on tough, low-cost CF cards. It’s always a good idea to record in CCU as well, especially for that once-in-a-lifetime stunt or reaction shot. Using the Panasonic cameras through the record racks means that true HD content can be provided within a reasonable budget. This system has been recently used for the full HD productions of Driving Academy (BBC), Full Stretch (Channel 4) and numerous inserts for Text Santa (ITV) over Christmas. The Panasonic camera is also currently being used on the new Kudos Production Nemesis (currently in production for BBC1/HBO) for all their specialist camera and stunt shoots. This versatile camera is very quick to rig, responds well to low light and, most importantly, is full HD and can match convincingly with footage from the main cameras on a shoot. A number of other benefits include: an adequate (but not good in bright light) 2” colour LCD screen; dual SD card slots allowing you to download rushes while continuing to shoot; speaker/headphone and HDMI output sockets allowing for listening and handy reviewing of footage; and a USB 2.0 interface allowing for connection to a PC or Mac. There are applications where the AG-HCK10G is not suitable, with the camera head being twice the size of a Sony HXR-MC1 and four times the size of a GoPro. It is often too big for a body rig or for a very discrete camera set-up. That said, I would put this camera at the top of the pile for most HD productions. We have used it for external and internal vehicle mounted shots, as a static camera for wide shots on multi-camera shoots, as fixed cameras in studios and on numerous hidden camera shoots. The wide-angle adapter and 15 meter extension cable makes the camera even more versatile for any shot where space is at a premium or you want to get the camera head further away from the recorder. A clear leader in the field of high-end minicam manufacturing is Toshiba. We have been using Toshiba minicams for top-end acquisition for over 15 years; with a wide choice of prime lenses this is our first choice for big screen and drama productions. Toshiba started in the medical arena, making small medical cameras long before they were commonly in use in TV and commercial film production. The Toshiba TU-48 was the minicam of choice for many years, from Top Gear to Nissan car commercials, but that was not HD. Toshiba’s IK-HD1 is now, as you would expect, a totally different camera. The IK-HD1 still has the same practicality of the TU-48 but now boasts BBC-approved HD with its three-CCD 1/3-inch interlace sensor outputting 1080 x 1920 via HD/SDI, composite or component. Not only is the Toshiba IK-HD1 the most compact HD camera on the market but with a choice of lenses (2mm, 4mm and 8mm) it gives the sharpest, clearest, true colour imagery available. It is also ideally suited to applications where extreme vibration is an issue due to its fixed prime lens; because of this it has been used as a bobsleigh-mounted camera at the Winter Olympics, along with other sporting events at the Commonwealth Games. Its 65 gram weight and 1.6 inch dimensions mean that this little camera can be used in even the smallest of spaces to give shots you simply cannot get with other cameras. Combine the Toshiba with a Polecam, with remote cable lengths of over 30 meters and the option of a waterproof housing, and you can achieve truly great HD shots, within a budget, that would never have been possible before. A big part of the minicam market is for multi-minicam location shooting and Prime has provided solutions for many memorable productions such as: Scariest Places on Earth, There’s Something About Miriam, Ant and Dec’s Saturday Night Take Away, The Sack Race, Sunday Night Project, Celebrity Stitch Up and Coach Tip. From the first production meeting for Scariest Places in 1999, it was clear that the regular multi-minicam set-up of numerous fixed cameras was not going to be enough for this huge multi-minicam production. The production called for 24 minicams in six rooms in a large, supposedly haunted, castle in Scotland. 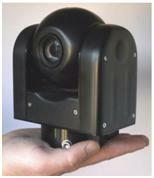 I proposed a remote mini-camera system from Bradley Engineering that we had just started testing. To be honest, the cameras were fraught with problems, the long cable runs were problematic and power/data issues presented serious learning curves, but in the end the production was a huge success and Prime has been pleased to work with Bradley Engineering (also sponsors of the GTC) ever since. In 2004 12 Yard Productions came to us to ask if we could build a mini-multicam set up in a coach for a new series for Channel 4 call ‘Coach Trip’. This involved five small Bradley Engineering Pan& Tilt cameras and two Toshiba TU-48 cameras, all ISO recorded to a purpose built control area at the back of the coach. The build and subsequent success of the ‘Coach Trip’ really showed what could be achieved in such a confined area with minicams. One of David Bradley’s great strengths is that he always listens to both cameramen and remote operators in his quest to develop the best camera and remote heads, he has consequently built up a range of products and a business that Britain should be proud of; their quality products are now used around the world and their remote heads will be used in many of the specialized applications at the London Olympics. We are lucky to have these cameras and the customer support so close to home. Prime now offers two types of Bradley cameras in their hire fleet of remote control minicams, namely the BE-HD10 and the smaller BE-HDC100. Both cameras use a Sony camera module, the same one found in the Sony HVR-A1 professional camcorder. Technology such as this 2 megapixel full HD CMOS chip camera module means this ultra-compact module is capable of producing full HD with 1080 lines of resolution. Bradley Engineering then takes the original Sony chipset out to be augmented and re-engineered to produce the highest quality noise-free, low jitter, pictures. The modules are also modified and improved for better usability, connectivity and control. The one-piece design has all the additional electronics, together with thermal management and fan cooling, built into the case. The BE-HD10 and the smaller BE-HDC100 can be used as single camera or muti-camera set-ups with a remote CCU unit together with an integrated protocol converter. This enables the camera head to be sealed to IP66 and data to be sent directly as RS485 to the CCU. It also enables the camera to work in higher ambient temperatures. Both cameras have 10:1 zoom lenses and both accept 37mm wide-angle lens converters. All functions are controlled remotely via equally well made joystick remote control units (RCU). 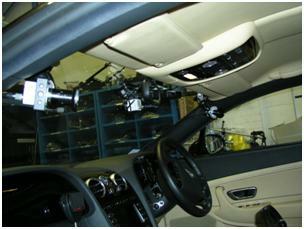 There is a choice of two types of joystick RCUs, a small four-camera controller and a larger eight-camera controller. The joystick RCUs are connected directly to the camera, with simple protocols and the CCU data includes the pan, tilt, zoom and focus. The camera is fitted with a wide-angle lens and can be positioned pretty much anywhere you like to get the shot you need, even at close range, and comes with a range of interchangeable outer lenses to disguise the camera as perhaps a shirt button or even a screw head. A high gain microphone is supplied and can be attached anywhere on your clothing. Full audio gain control is offered in the menu system, allowing crisp clear vocal audio recording no matter what the environment the filming is taking place in. If you are looking for the very highest quality video possible from an undercover filming kit (already being used by reporters at BBC, Sky News and ITV), then this is the package to go for. Prime TV tailors most minicam requests to suit the production and client, custom building hides for specific projects, and has experience of hiding cameras in just about every situation. You don’t need micro-minicams for complete surveillance or hidden camera entertainment shows, we have converted over 200 day to day bits and pieces for Pan & Tilt camera hides. These include a variety of different speakers; floor and wall book shelves and cabinets; microwave ovens and small stacking crates; and wheelie bids and bird houses. We used to have a great deal of success with hidden cameras in tube TV’s but with the influx of flat screed TV’s these are no longer an option. So it is important to really understand the production, people you are filming and the location before deciding on a camera hide. It is also important to have at least one person in the production (within the hit), in the know as this person can always divert any suspicion away from a camera/camera hide. On a shoot for ‘My new best friend’ with Mark Wooton, the hit subject opened the microwave in the kitchen to reveal a camera; the whole production held it’s breath thinking the whole days rig and shoot would be over, but the quick thinking Mark Wooton blurted out (while shutting the microwave door) that his flat mate was secretly filming his girlfriend in the kitchen as she was a lousy cook. This was promptly accepted, the production staff breathed a huge sigh of relief and the hit carried on with great success. The quality of minicameras these days can actually be negative to certain productions. In a recent hidden camera production for the BBC there were articles in the press suggesting the shots were too good to be hidden cameras and therefore must have been staged. I have often been asked to film the set of the hidden cameras so that the production has proof of the minicam build and the option of using the footage with the programme, in the opening or closing sequence.